Figure 1: Experimental spectrum integrated over 4500 FLASH pulses (red circles) and the best fit of a calculated spectrum with ne = 2.8*1020 cm3 and Te = 13 eV (solid blue line). Comparison to fits with variation in density (left graph), 5.6*1020 cm3 (dashed green) and 1.4*1020 cm3 (dash-dotted brown), and in temperature (right graph), 20 eV (dash-dotted brown) and 5 eV (dashed green), are shown. 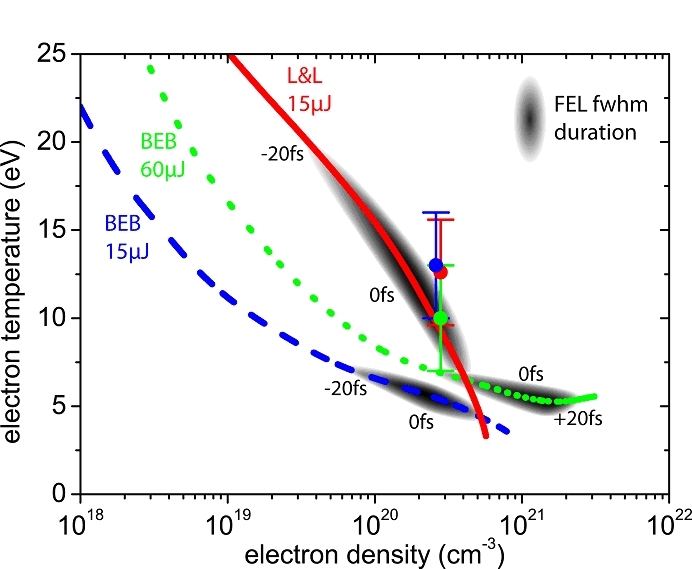 Figure 2: Measurements (colored circles) compared to the simulated evolution of the target's free electron density and temperature using different impact ionization cross sections and FEL pulse energies: Lieberman and Lichtenberg (solid red, 15 µJ) and the BEB model (15 µJ dashed blue, 60 µJ dotted green). The FEL full width half maximum duration is indicated in gray scale. Published as: "R.R. Fäustlin et al. Observation of Ultrafast Nonequilibrium Collective Dynamics in Warm Dense Hydrogen", Phys. Rev. Lett. 104, 125002 (2010). The short pulse duration and high intensity of FLASH soft x-ray radiation at DESY allows us to generate and probe highly homogeneous warm dense non-equilibrium hydrogen within a single light pulse. By analyzing the spectrum of the 13.5 nm Thomson scattered light we determine the plasma temperature and density. The results are compared via simulations with different models for impact ionization, which is the main interaction on this early femtosecond time scale during the evolution of the plasma. We find that classical models of this interaction describe our dense plasma conditions better than state of the art theories. This has implications for various fields ranging from planetary astrophysics to inertial confinement fusion. Warm dense matter is a plasma state of a few eV (few 104 K) temperature and near solid density . It is present, among other phenomena, in planetary interiors  and as a transient state in many laser-plasma experiments, including inertial confinement fusion . The investigation of warm dense matter (WDM) is challenging from experimental as well as theoretical aspects. Theory faces an intermediate state between an ideal plasma, with no particle correlations, and condensed matter, with strong correlations. Thus, state of the art models are ambiguous in the WDM regime demanding experimental verification. Also, the plasma equilibrates within picoseconds and decays into ideal plasma and condensed matter states over nanoseconds, demanding fast measurement techniques. Optical radiation cannot penetrate the WDM sample, due to its high free electron density. We can overcome these challenges by applying the ultrafast soft x-ray radiation of FLASH. The sample for the experiments is liquid hydrogen with a temperature of 20 K (2 meV). It is injected as a jet through a nozzle into our vacuum chamber using a temperature controlled helium flow cryostat. FLASH pulses at 13.5 nm with 40 fs pulse duration and energies of 15 µJ are focused on a 20 µm hydrogen droplet, penetrating it deeply, so that a homogeneous plasma is generated. During the fs interaction a fraction of the hydrogen atoms is photoionized and the free electrons begin to form a Maxwell-Boltzmann kinetic energy distribution, predominantly via subsequent impact ionizations with the remaining neutral hydrogen atoms and also via electron-electron collisions. Animation 1 shows the simulated evolution of the free electron distribution. Part of the FLASH pulse does not photoionize but is scattered instead – a process called Thomson scattering (TS). The scattered light can be used to diagnose the plasma. This technique has been employed in the optical regime for low density plasmas  as well as the x-ray region for higher densities and based on high power optical lasers with ps to ns pulse lengths [5-6]. The unique facilty FLASH with its ultra-short soft x-ray pulses enables us to probe fast processes in dense non-equilibrium plasma. To record the TS spectra, we built a specific spectrograph . Figure 1 shows one of the recorded spectra. It consists of a red and a blue shifted peak, which stem from electronic plasma resonances. The photon energy shift of these plasmons with respect to the incident radiation allows the determination of the plasma free electron density . We obtain a density of 2.8x1020 cm-3, which corresponds to ~1% ionization in the sample. Furthermore, a free electron temperature of 13 eV (~150000 K) is measured through the intensity ratio of the two plasmons via detailed balance. The intensity ratio changes in favour of the blue shifted plasmon with increasing temperature. A particular characteristic of our measured spectra is a strong suppression of the elastically scattered light. This is due to the diffuse Debye-Waller effect in WDM which has been predicted  and was observed previously in laser based experiments with a low ion temperature . From the observed suppression of elastic scattering we calculate an ion temperature below 0.1 eV (1200 K). In conjunction with the measured electron temperature, this indicates a strong non-equilibrium plasma. Furthermore, we compare the measurements with simulations based on kinetic equations  for two different impact ionization models: The ‘Binary Encounter Bethe’ model is a state of the art model and in good agreement with experiments on low density plasmas . The second impact ionization model is based on the theory of classic electron-electron collisions . The cross sections of the two models deviate significantly in the relevant electron kinetic energy range below 100 eV (1200000 K). Both simulations yield the sample evolution in terms of free electron density and instantaneous temperature (2/3 of the average electron kinetic energy). Figure 2 compares these trajectories with the measurements at FLASH. Measurement and model are consistent, if the simulated trajectory crosses the data points at the peak of the FLASH pulse. At the high densities of this experiment, it is not the state of the art, but the classical impact ionization model which shows significantly better agreement with the measurements. In summary, we have been able to investigate with FLASH for the first time fundamental interactions in a dense plasma and on an ultrafast timescale. A clear understanding of the mechanisms that leads to the alteration of the impact ionization cross section in this dense plasma regime has not yet been established. However, this discovery raises new questions and demands further investigation. These findings are of most importance for laser-matter-interaction and inertial confinement fusion research. National Research Council: Frontiers in High Energy Density Physics: The X-Games of Contemporary Science. 2003: National Academies Press. Nettelmann, N., et al., Ab Initio Equation of State Data for Hydrogen, Helium, and Water and the Internal Structure of Jupiter. The Astrophysical Journal, 2008. 683(2): p. 1217. Lindl, J.D., et al., The physics basis for ignition using indirect-drive targets on the National Ignition Facility. Physics of Plasmas, 2004.11(2): p. 339-491. Evans, D.E. and J. Katzenstein, Laser light scattering in laboratory plasmas. Reports on Progress in Physics, 1969. 32(1): p. 207. 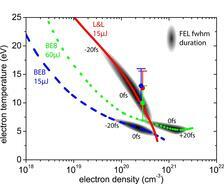 Garcia Saiz, E., et al., Probing warm dense lithium by inelastic X-ray scattering. Nature Physics, 2008. 4(12): p. 940-944. Kritcher, A.L., et al., Ultrafast X-ray Thomson Scattering of Shock-Compressed Matter. Science, 2008. 322(5898): p. 69-71. Fäustlin, R.R., et al., A compact soft X-ray spectrograph combining high efficiency and resolution. Journal of Instrumentation, 2010. 5(02): p. P02004. Gregori, G., et al., Derivation of the static structure factor in strongly coupled non-equilibrium plasmas for X-ray scattering studies. High Energy Density Physics, 2007. 3(1-2): p. 99-108. Ravasio, A., et al., Direct observation of strong ion coupling in laser-driven shock-compressed targets. Physical Review Letters, 2007.99(13): p. 135006. Hwang, W., Y.-K. Kim, and M.E. Rudd, New model for electron-impact ionization cross sections of molecules. The Journal of Chemical Physics, 1996. 104(8): p. 2956-2966. Lieberman, M.A. and A.J. Lichtenberg, Principles of plasma discharges and materials processing. 1994: John Wiley & Sons, Hoboken, New Jersey. 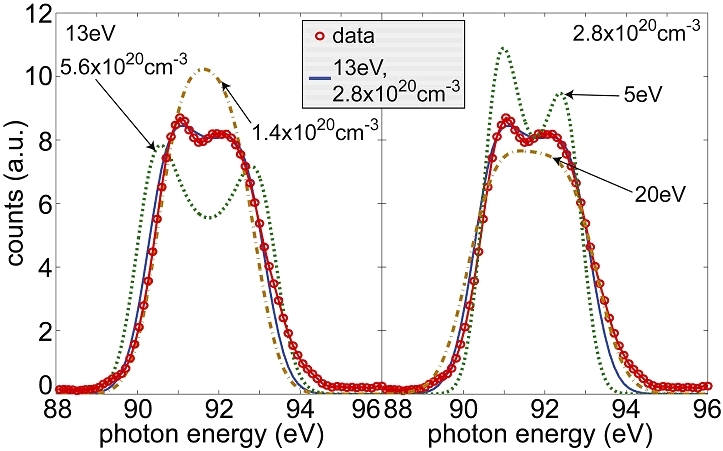 Ziaja, B., et al., Energetics, Ionization, and Expansion Dynamics of Atomic Clusters Irradiated with Short Intense Vacuum-Ultraviolet Pulses. Physical Review Letters, 2009. 102(20): p. 205002.